Spring is finally here and it’s time to spring clean our homes. I know this may sound a little odd, and it’s my Type A personality coming out, but I LOVE to clean! I especially love the final product of seeing something organized and clean. My family used to laugh at me when I was young because I would organize all of the clothes in my drawer, and then I would organize my sisters’ clothing drawers. Thank goodness I’m not quite that bad anymore, but I still do like things to be cleaned and organized. This month, I’ll have a series of posts about spring cleaning. 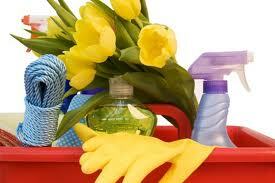 I hope to motivate and give you tips to spring clean your home. I’ll also give time-saving and money-saving cleaning tips that will help you out. So let’s get started! Take a few minutes to mentally survey each room. Then in a notebook, write down the problem areas in the room that need improvement. These should be parts of the room that bother you, or that your family has a difficult time keeping neat and clean. You need to realize that you don’t need to get your spring cleaning completed all in one day or one weekend. With two young children, there’s no way that I can focus on something for more than 15-30 minutes at a time. I plan to do my spring cleaning over the course of the month. This is something I enjoy doing. Make sure to check off each item as you complete the task. It’s a way to show that you’ve accomplished something, and I think it feels great to mark an item off the list. Here are some cleaning checklists that will help you out. Now, you’ll need a game plan to help you prioritize and stay on task. Pick a room a day and get it cleaned and organized before moving onto the next one. That way you don’t just transfer items from one room to another before deciding what to do with the items. Make sure to begin with the least favorite rooms first when you are most motivated. Once you complete the most difficult areas of your house at the beginning, everything else will feel much easier to finish. Gather your supplies in a bucket and carry them with you from room to room so you don’t waste time running back to the cleaning closet. Gather storage tubs or garbage bags and label them with the following categories: Keep, Throw Away, Recycle, Sell, and Donate. As you look through the items in your home, decide what you want to do with each item and place it in the appropriate pile. Don’t think of spring cleaning as a chore. Instead, think of it as something that will help you feel good about yourself and your clean and organized home. Play some fun, upbeat music while you dance around the house with your spring cleaning supplies. Set the timer to give yourself time limits for completing small tasks, and try to complete the tasts before the timer goes off. Once you’ve finished cleaning or decluttering for the day, congratulate yourself for a job well done by rewarding yourself with something like a movie or dinner out. Remember that getting started is the hardest part of spring cleaning. Great tips. We have a link party called Wednesdays Adorned From Above Blog Hop and would love to have you share this and any other posts with everyone. It runs from Tuesday night through midnight Sunday. Here is the link to the party. Thanks for telling me about it. I will check it out.